Next month 34,000 troops from the the Self-Defense Forces will conduct an island landing drill on Okinawa. Japan’s Defense Ministry has announced that 34,000 troops from the Self-Defense Forces (SDF) will practice island storming drills starting next month. According to The Yomiuri Shimbun, from November 1 to November 18, troops from the Ground, Maritime and Air Self-Defense Forces will perform an island landing drill on Okinawa Prefecture. An AFP report said that destroyers and F-2 fighter jets would simultaneously conduct live fire drills. The Yomiuri Shimbun report, which cited a statement from Japan’s Defense Ministry, said the purpose of the drill was to enhance the SDF’s ability to protect disputed islands in the East China Sea from Chinese intrusions. However, Okinawa Prefecture is far away from the Diaoyu/Senkaku Islands, which are at the heart of the ongoing dispute between China and Japan. Although the ongoing dispute with China undoubtedly factors into the exercise, Japan often conducts large military drills during the month of November. AFP points out that 35,000 Japanese troops participated in a similar island landing drill in November 2011. The U.S. and Japan also conducted a large joint exercise last November but called off the island-storming part of the drill in order to avoid antagonizing China. With the Sino-Japanese dispute intensifying significantly over the last year, Tokyo has unsurprisingly decided to go ahead with the island-landing portion of the drill this year. 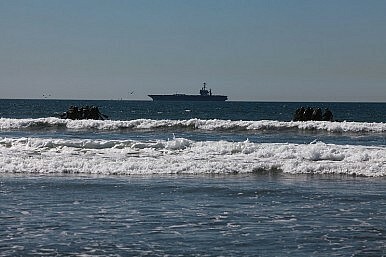 In fact, the U.S. and Japan militaries conducted a beach storming drill that simulated retaking captured territory off the coast of California back in June. Earlier this month the two nations conducted another joint drill that incorporated the V-22 Osprey tilt-rotor aircraft for the first time. The V-22 Osprey allows for troops to be transported quickly. There is a more practical consideration to the upcoming Japanese SDF drill. According to The Yomiuri Shimbun, Japan’s Western Army’s Infantry Regiment (WAIR) based out of Sasebo, Nagasaki Prefecture will be the main force conducting the island landing drill. WAIR has been designated by Japan’s Defense Ministry as the force that will contribute the initial troops for Japan’s first U.S.-Marines like amphibious force. The Asahi Shimbun reported earlier this month that the creation of the amphibious force will be officially unveiled in December when Japan’s Defense Ministry releases the National Defense Program Guidelines. It will initially consist of 700 infantry troops from WAIR but will eventually grow to 3,000 troops, according to the report. Mizokami goes on to note that Tokyo has so far eschewed developing a marine force because they are typically seen as offensive in nature and thus inconsistent with Japan’s Pacifist constitution. For a number of years now Japan has been quietly working towards ultimately acquiring an expeditionary force capable of self-deploying air and sea power to protect its outer islands, however. These initial plans were accelerated last year as Tokyo’s dispute with Beijing began to pick up steam. In doing so, it has declared that the marine force will be “defense-minded” and thus compatible with Japan’s constitution. This designation is undoubtedly disputed by China, and likely to worry some of Tokyo’s other neighbors, including South Korea. * Corrected. Thanks to commenter Mareo2 for pointing that out.